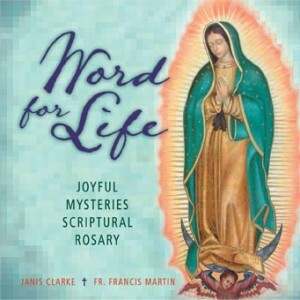 the prayers of the Rosary which are themselves scriptural. background music comprising improvisations on traditional hymns and compositions by Janis Clarke. profound scripture meditations before each decade, scripture passages before each Hail Mary and inspired scriptural chants composed by Janis (after each decade) that correspond to the 5 joyful mysteries. A classical rendition of Salve Regina and a beautiful hymn to Our Lady of Guadalupe, composed by Janis Clarke, to conclude the rosary. An invitation to enter with Mary, into the major events of Jesus’ youth, beginning with his conception and continuing to his being found by his parents in the temple.